All of our rooms are bright and spacious, and are literally steps away from the beach. They all have unique en-suite open-air bathrooms, fans, mosquito nets and coils, flashlights, umbrellas, safe boxes, and solar heated water. Rooms do not have televisions or A/C, in keeping with the spirit of taking pleasure in the abundance of nature and serenity. And even though we are "off the grid", we make one exception: there is free WiFi in every room . 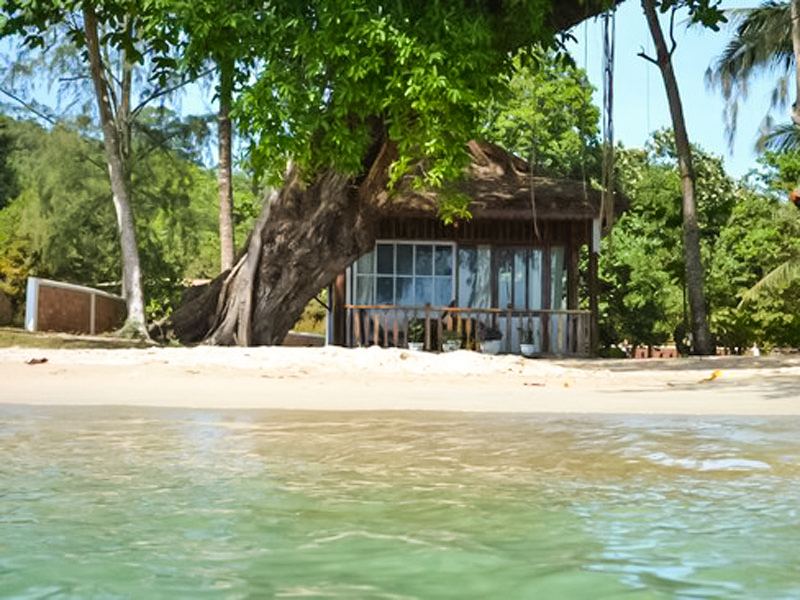 No matter what room you stay in, you can be sure to hear the waves lapping, all the livelong day. Check rates, availability, and book instantly: online. 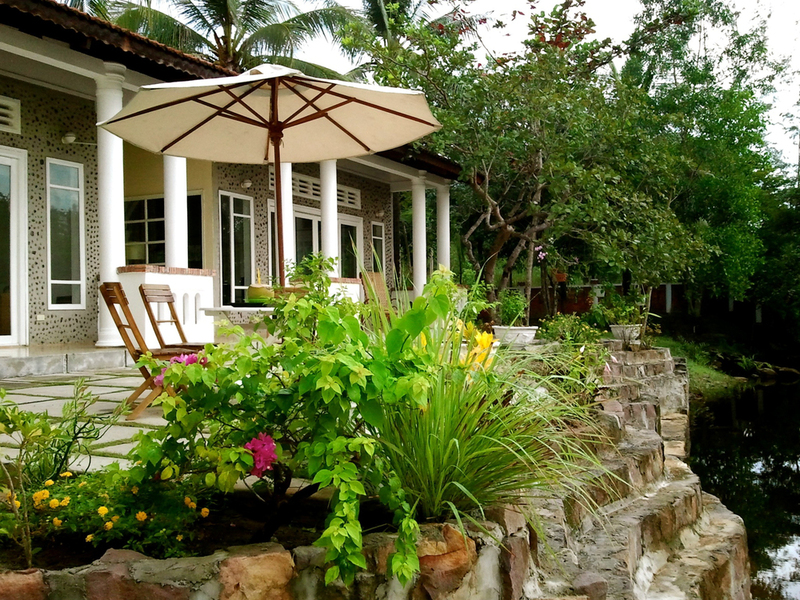 Our two "villas" are located in a secluded part of the property, facing a small stream that flows into the sea. These are the owner’s rooms, and contain some personal items/decorations, adding to the “homey” atmosphere. The villa rooms are adjoined and can be booked individually or together. The Coconut Villa is a very spacious room with a Queen bed, a small couch, a separate lounging area and a splendid half-roofed bathroom that has two open-air showers, and a coconut tree growing in it (hence the name). This room is available for instant online direct booking. 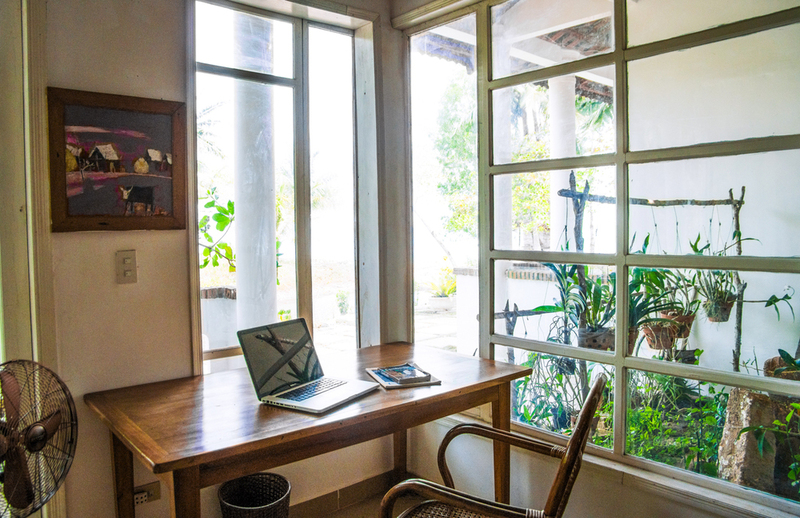 The Cashew Villa is our largest room and is best suited for families or long staying travelers. It has one double bed in the room, as well as an extra single bed. There is a kitchenette and dining table, as well as a large sofa in the separate lounging area. The bathroom has a tub and an open-air shower. There is a mature cashew tree growing just off its front porch (hence the name). Extra Bed: Already in the room. 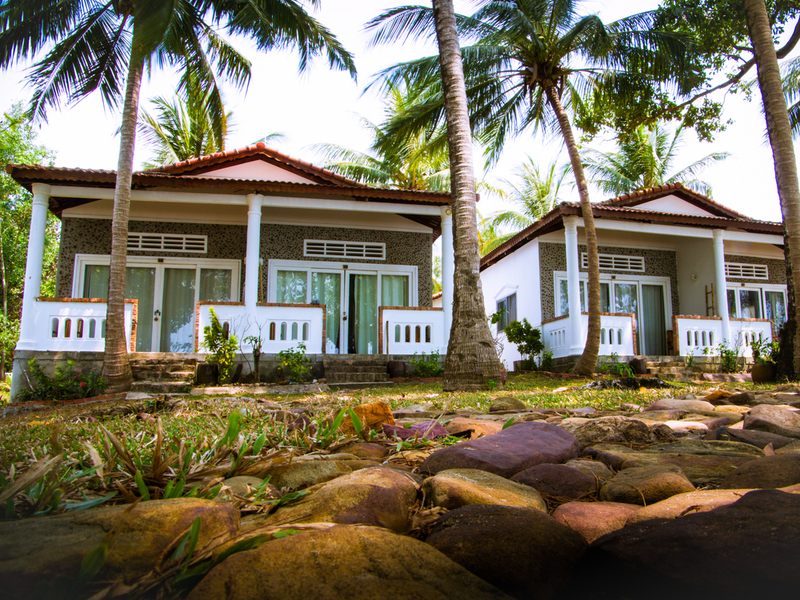 All the Beachfront Cottages are spacious and bright, and have full facing, unobstructed sweeping views of the sea from their private terrace. Six of them are on one side of the property closer to the reception/ common area. Four of them are on the other side of the property across a stream. All are within three (3) to ten (10) meters from the beach. These rooms are available for instant online direct booking. The Seaview-Garden Cottages are spacious and bright and all have very lovely partial views of the sea. Located on the side of the property closer to the reception/common area, they are all a mere fifteen (15) meters from the beach. All have either one double bed or two double beds, and are very similar in décor to the Beachfront Cottages. *These rooms are available for instant online direct booking. 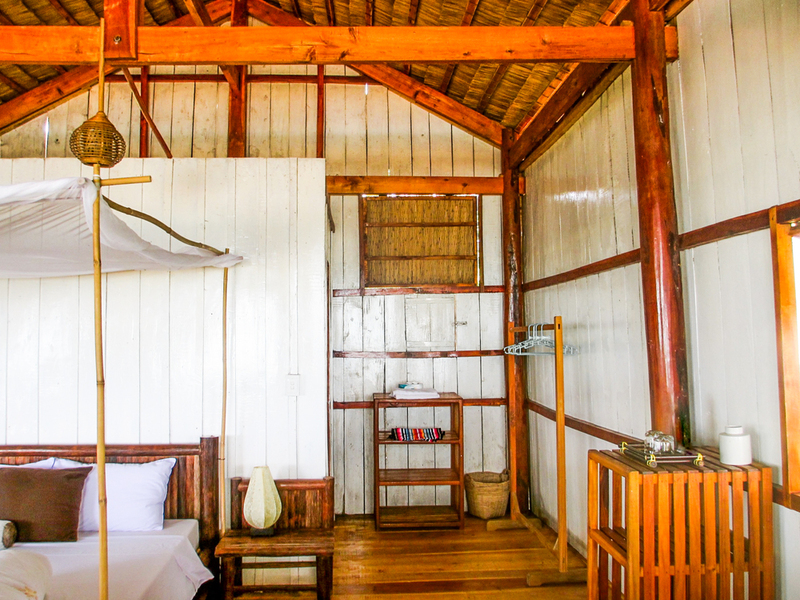 A traditional styled house of the Vietnamese countryside, this room is completely made of wood and is quite different from our other rooms. Only two (2) meters from the beach, it has eye-smacking views of the sea. It has one queen size bed and does not have an outdoor shower like the other rooms. The windows open around this room, allowing for natural airflow throughout the day. It is cozy, rustic and romantic and has its own porch with a sofa and hammock for relaxing in. The Stilthouse, sitting about 10 meters from the beach, is one of our most resplendent accommodations, with an extra-spacious sleeping and sitting area, and soaring ceilings. The decor is inspired by the old town of Hoi An. The Stilthouse has one Queen bed and a large wooden porch, with its own hammock and lounge chair, overlooking a spectacular unobstructed view of the beach and water. 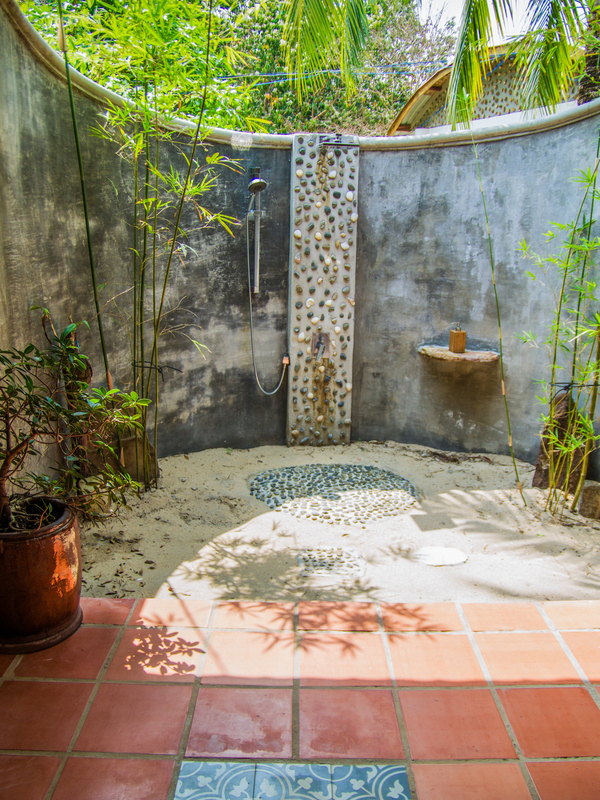 The garden-like bathroom has a covered shower, an open-air shower and a hand-sculpted concrete soaking tub. The River House and Waterfall House sit adjacent to each other and are perched on stilts over an extremely picturesque small river that runs into the sea. They are located in a slightly more secluded part of the property. The River House has high ceilings, a Queen bed, and a lovely half-roofed bathroom that has an open-air shower and a hand-sculpted concrete soaking tub. There is also a deck to enjoy the special view of the river and sea. This room is available for direct booking by making an inquiry with our email form. 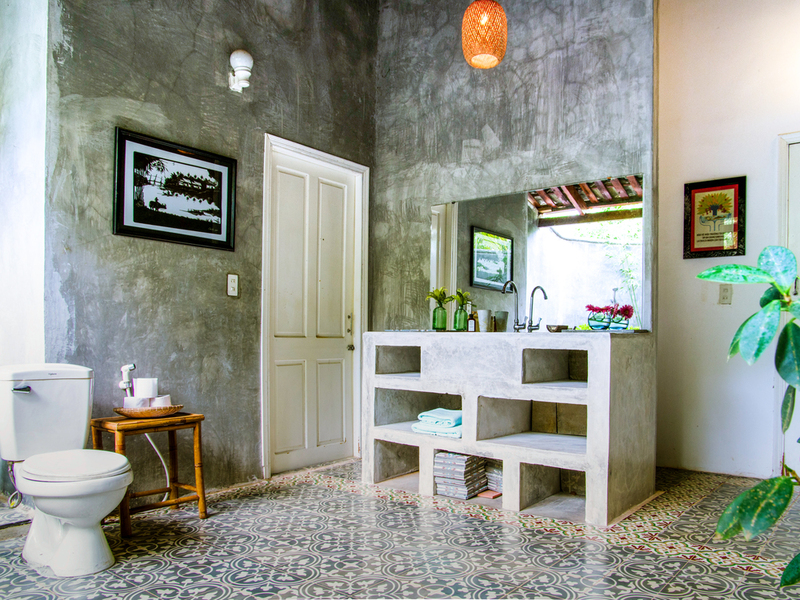 The Waterfall House is very similar to The River House; it also has high ceilings, a Queen bed, and a lovely half-roofed bathroom with an open-air shower and a hand-sculpted concrete soaking tub. 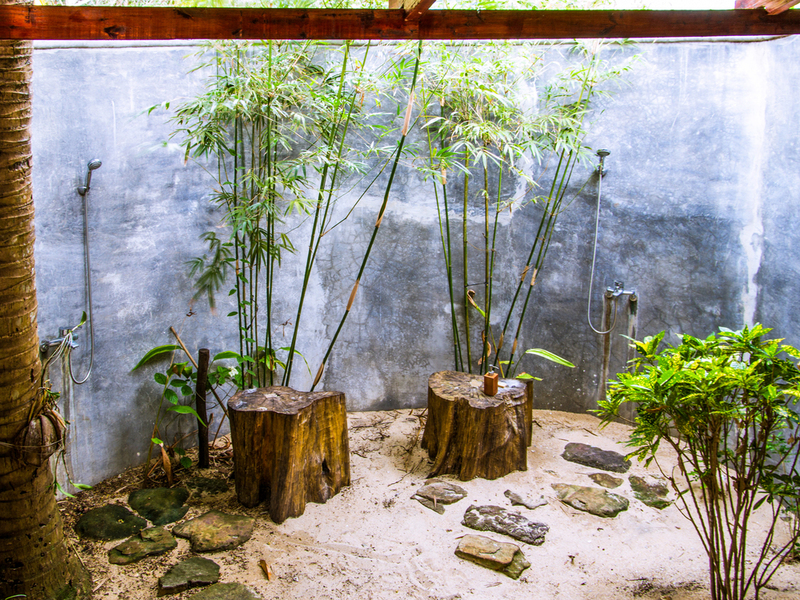 The Waterfall House has an additional floor-to-ceiling view of the cascading stream from sleeping area. There is also a deck to enjoy the special view of the river and sea.